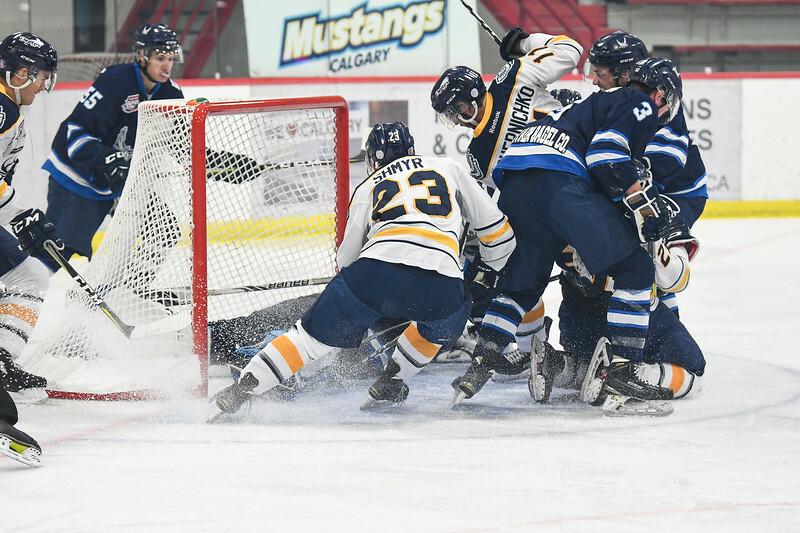 Mustangs lose a hard fought battle 4-1 to the Canmore Eagles in their 2017-18 season home opener at the Father David Bauer arena. 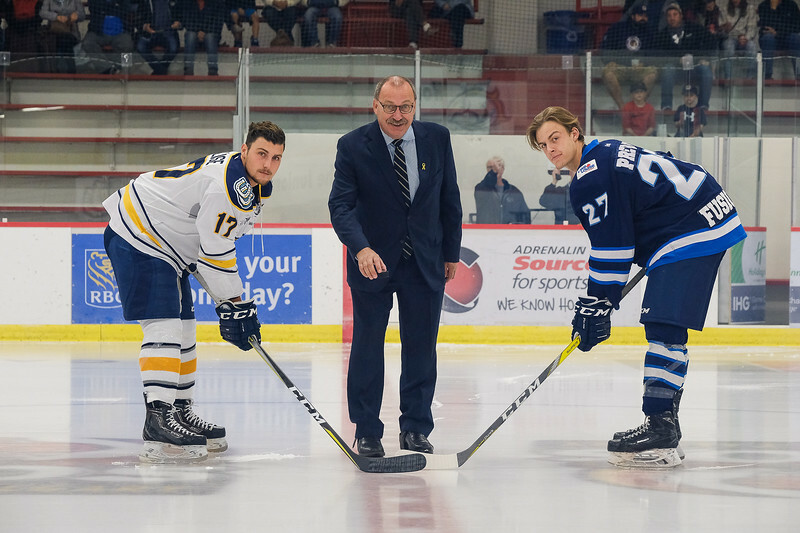 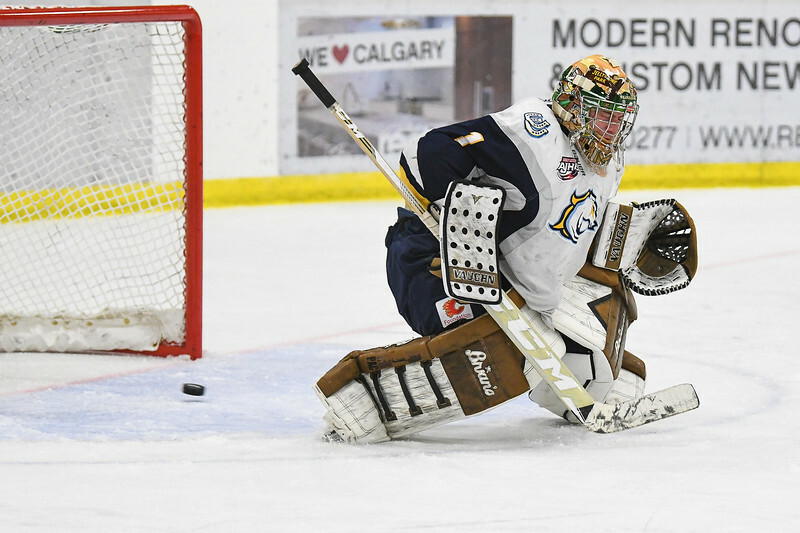 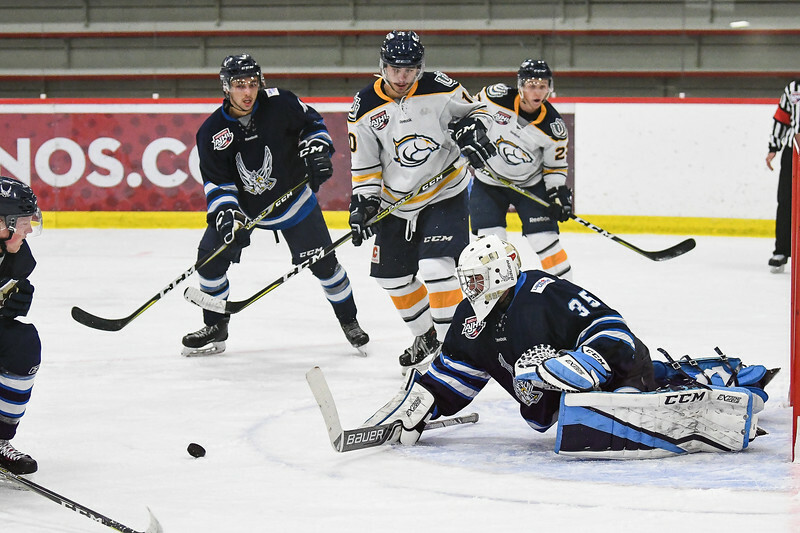 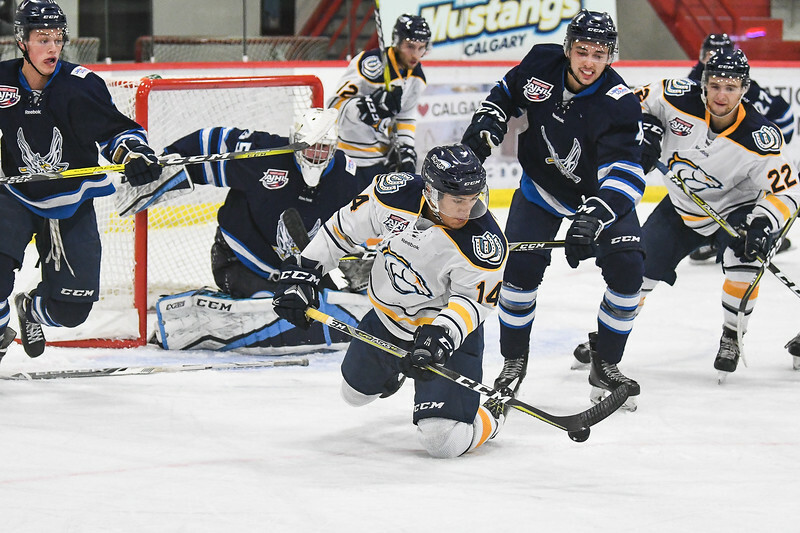 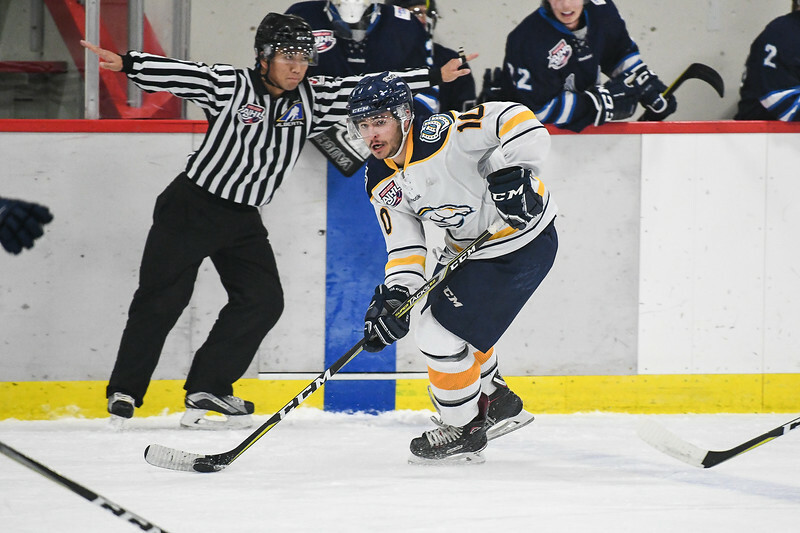 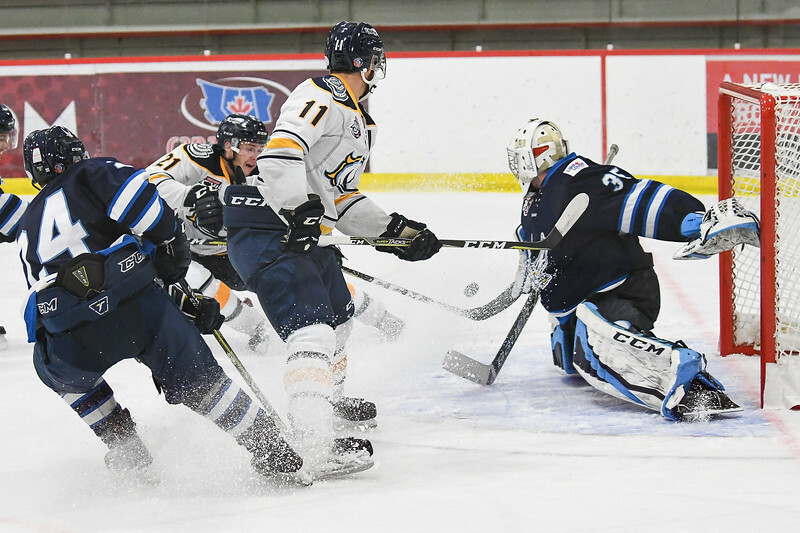 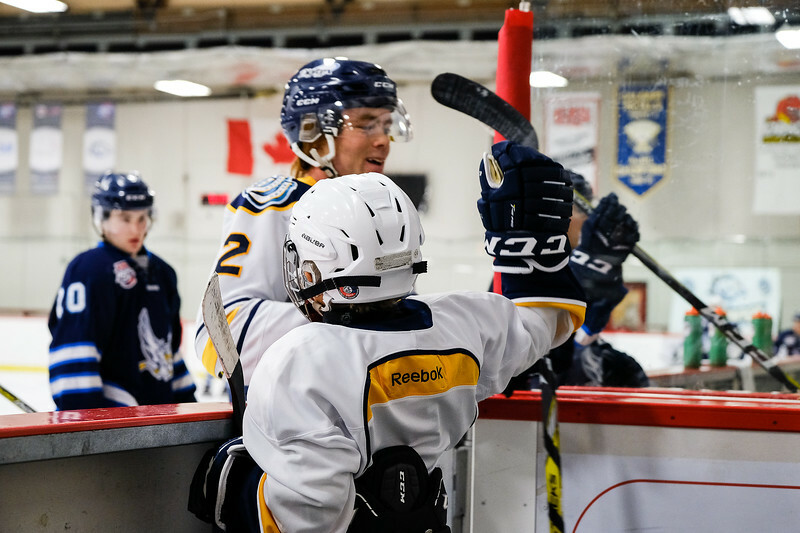 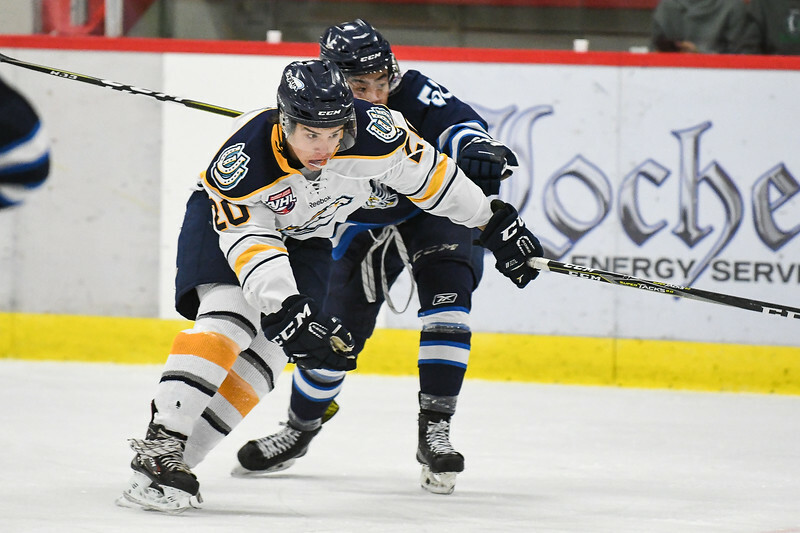 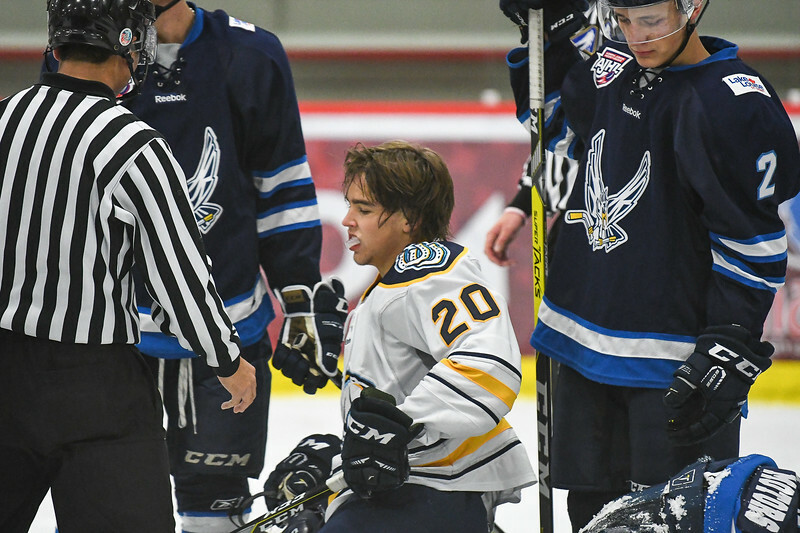 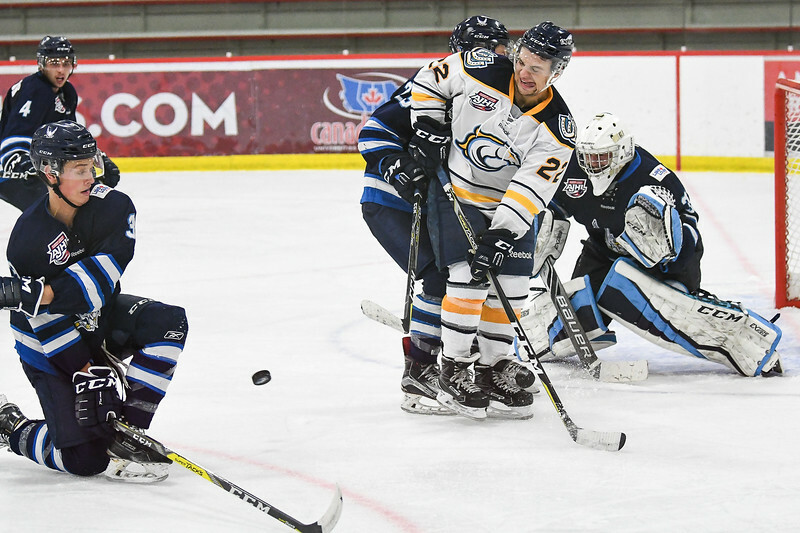 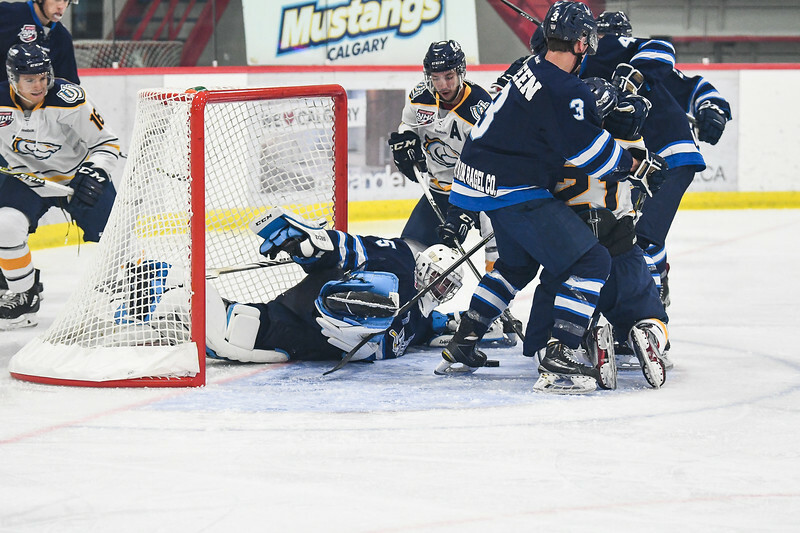 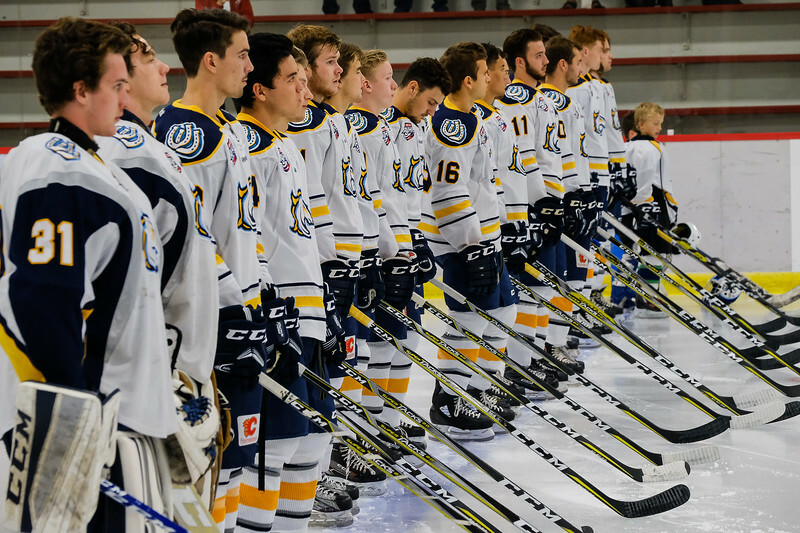 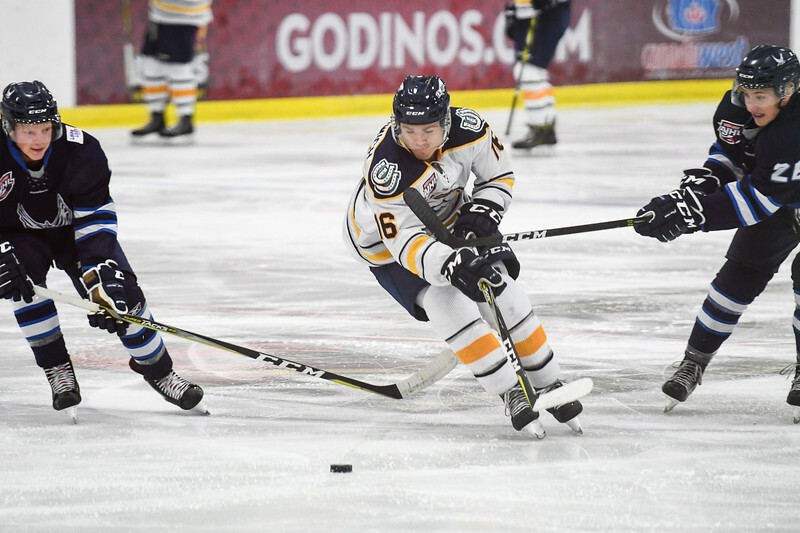 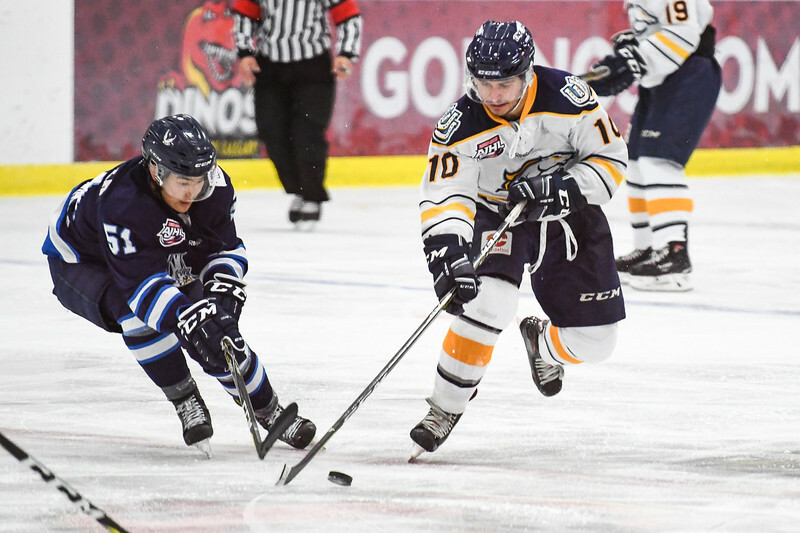 During the homeowner of the 2017-8 AJHL season in a game between Calgary Mustangs and the Canmore Eagles at the Father David Bauer arena Calgary, Alberta. 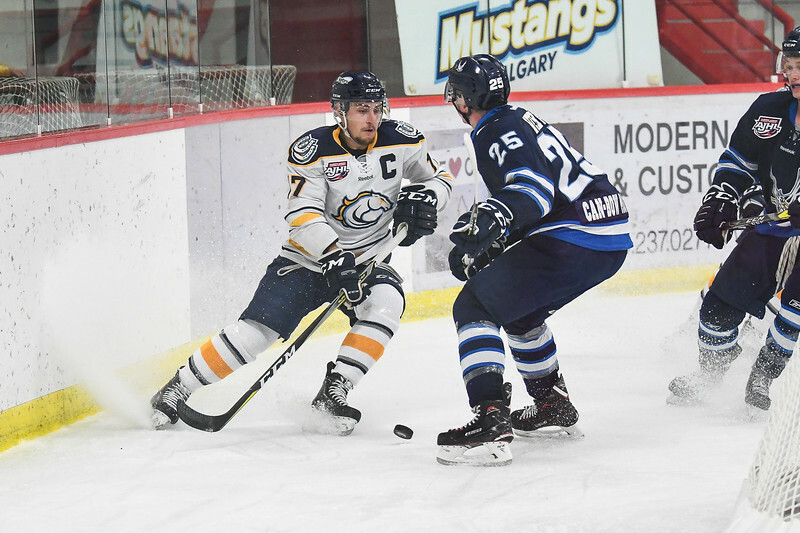 Calum Humble (1) grimaces as the puck slides past during the homeowner of the 2017-8 AJHL season in a game between Calgary Mustangs and the Canmore Eagles at the Father David Bauer arena Calgary, Alberta. 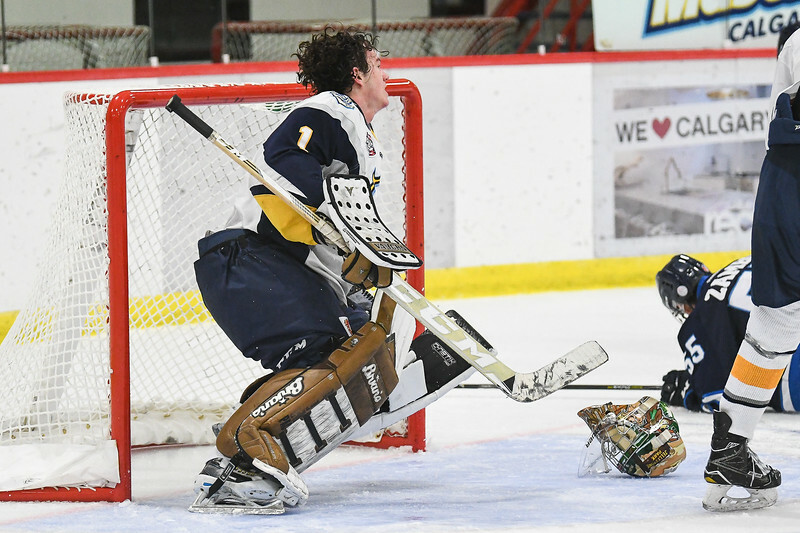 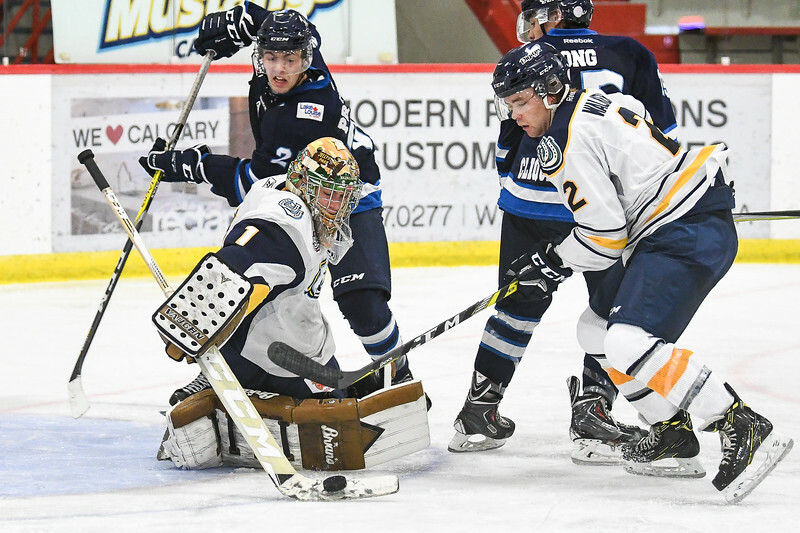 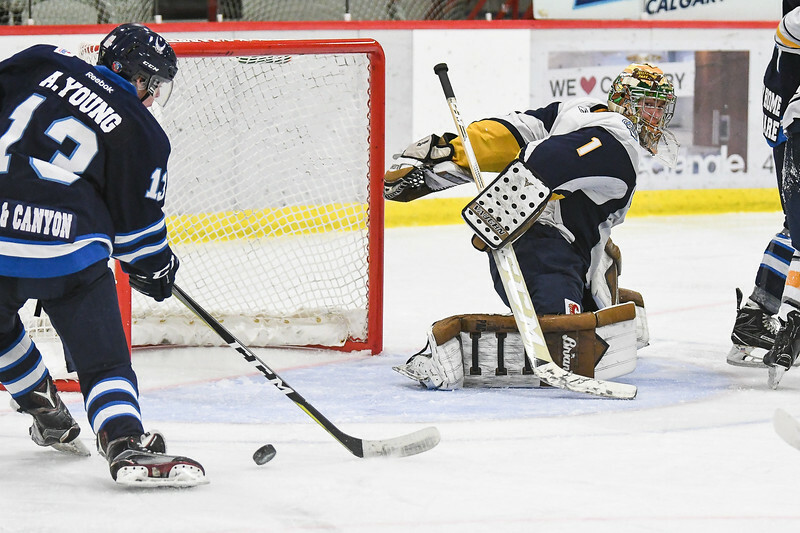 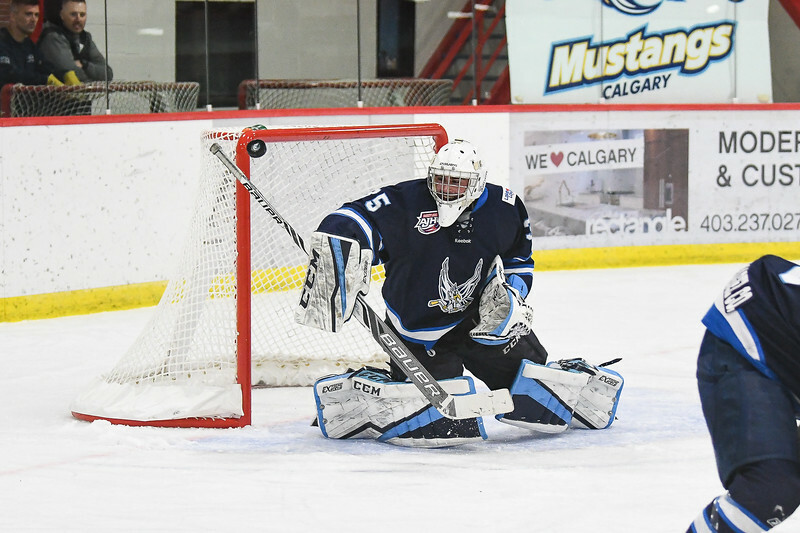 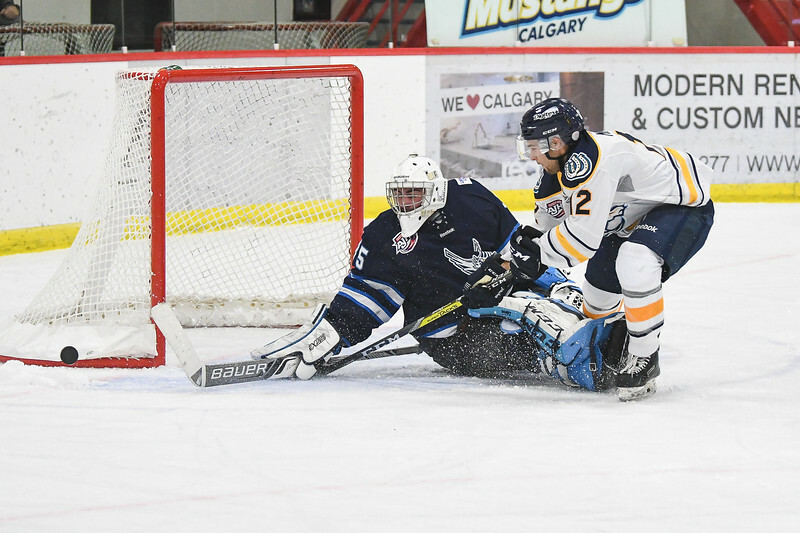 Mustangs goalie Calum Humble (1) turns away Canmore Eagles Alex Young (13) during the homeowner of the 2017-8 AJHL season in a game between Calgary Mustangs and the Canmore Eagles at the Father David Bauer arena Calgary, Alberta. 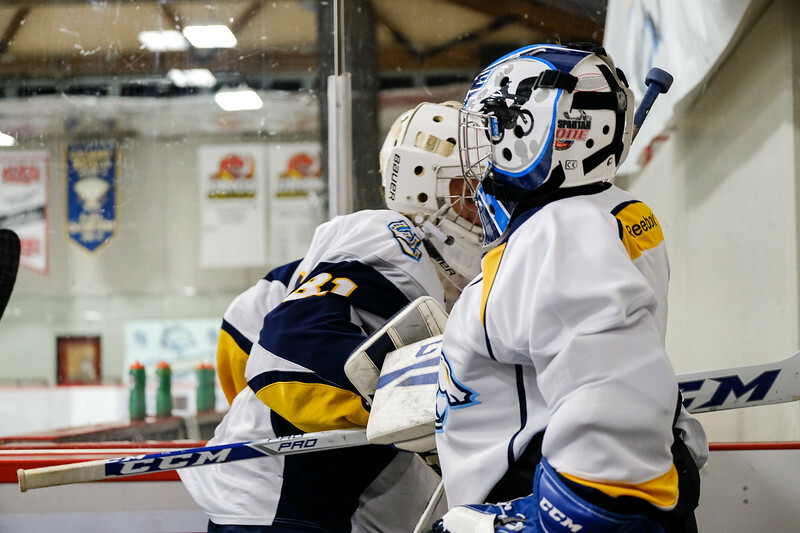 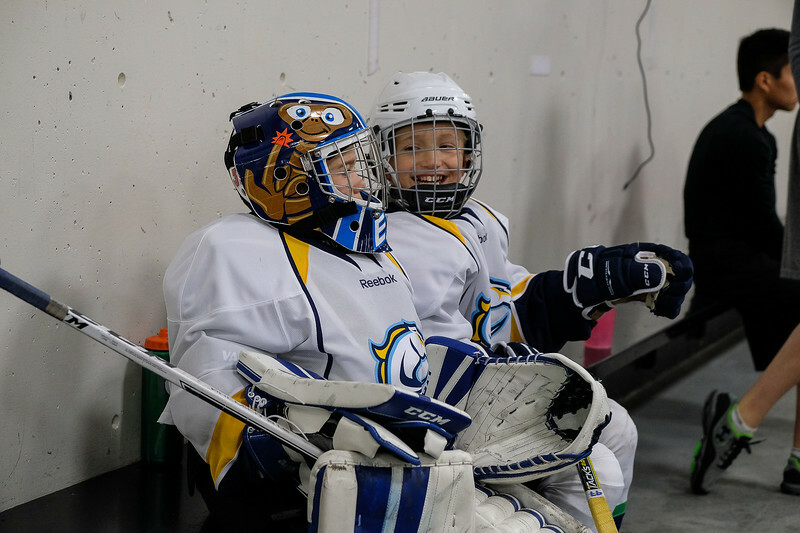 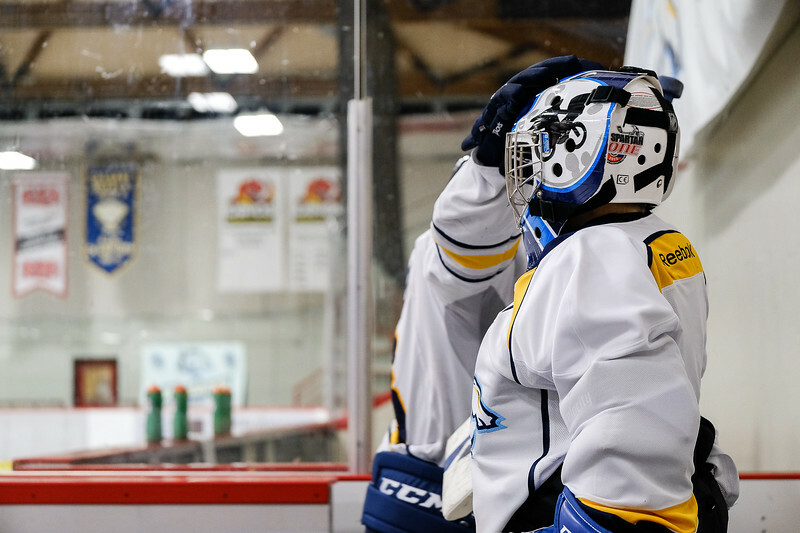 Jackson Salt takes a breather during the homeowner of the 2017-8 AJHL season in a game between Calgary Mustangs and the Canmore Eagles at the Father David Bauer arena Calgary, Alberta. 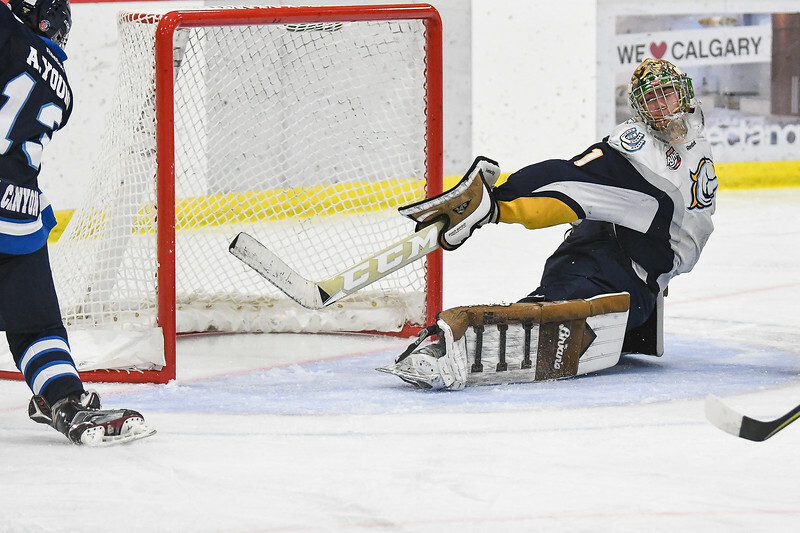 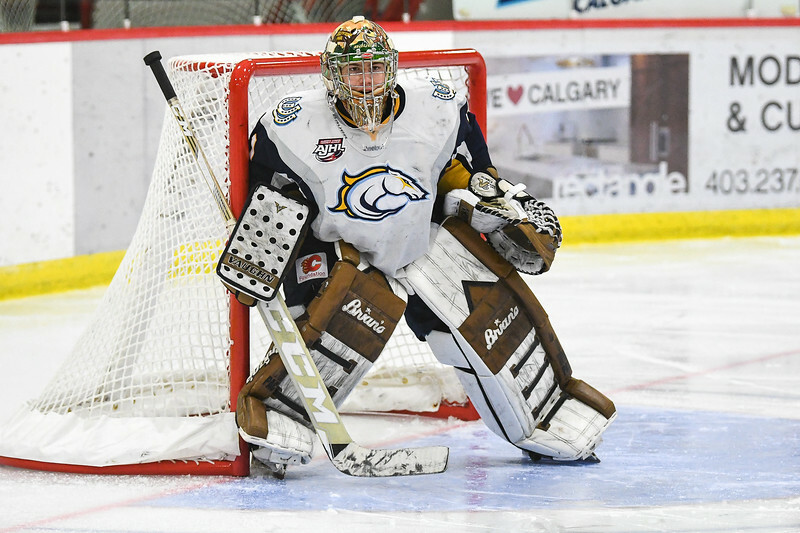 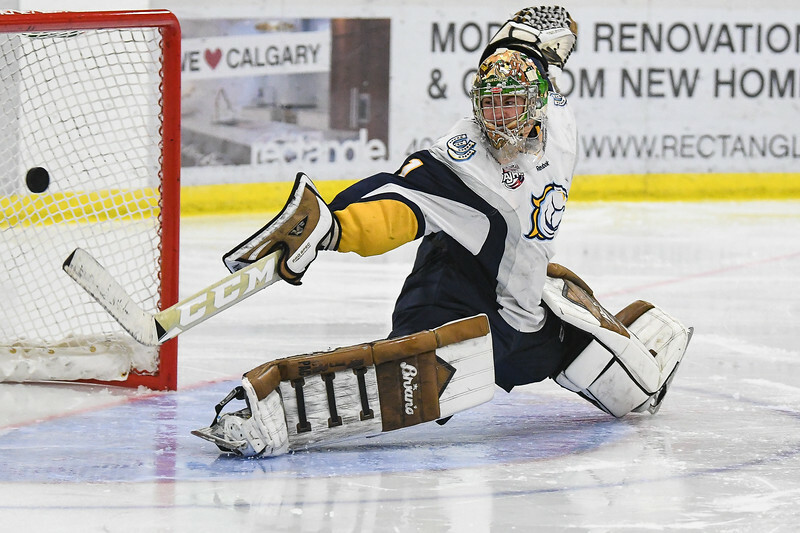 Logan Heimann directs the puck to the Canmore net during the homeowner of the 2017-8 AJHL season in a game between Calgary Mustangs and the Canmore Eagles at the Father David Bauer arena Calgary, Alberta. 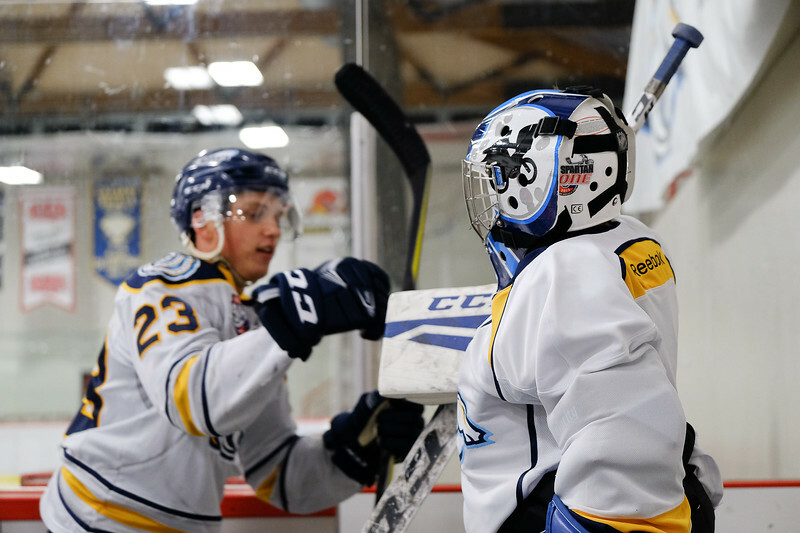 Calum Humble (1) loses his mask during action in the homeowner of the 2017-8 AJHL season in a game between Calgary Mustangs and the Canmore Eagles at the Father David Bauer arena Calgary, Alberta.